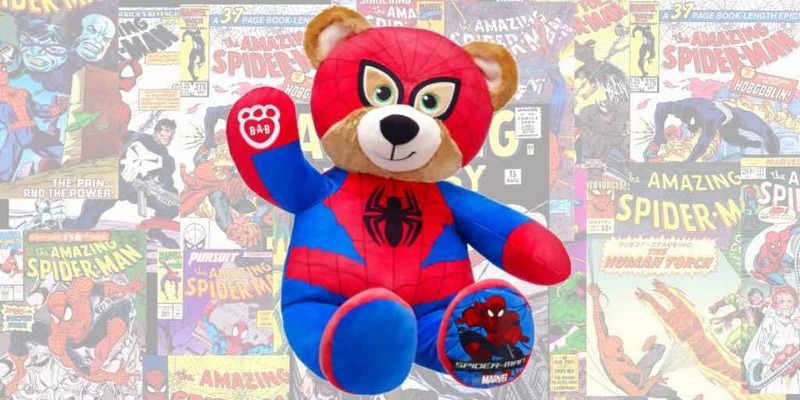 Spider-Man Bear Available Now At Build-A-Bear | Nerd Much? In celebration of the upcoming Spider-Man: Homecoming film (due July 7 of this year), Build-A-Bear has officially made available the Spider-Man Bear and Spider-Man costume. The Spider-Man Bear already has his costume on, so there is no need to buy the extra one unless you like the look of it better. The bear goes for $28 and “features an exclusive Spider-Man graphic on his left paw.” He’s also got beautiful green eyes and is 16 inches tall. The Spider-Man costume goes for $16 and is described as “ultra-cool,” something I can picture Spider-Man himself saying. The costume is a two piece set that fits any bear from the Build-A-Bear shop, so if you want to give your teddy bear an alter-ego as the hero Spider-Man, you can. You can also purchase the 5-in-1 Spider-Man Sound for $7. This is the usual sound recording that you can insert into your bear, presumably this sound has something iconic from Spider-Man. There are no details on what exactly, so be sure to check out the website linked above and sign-up for updates. For more of the latest ridiculously cool stuff, stay tuned to Nerdmuch.com.